For us, stewardship isn’t lip service. All Silver Star Brands team members have environmental responsibility and accountability as part of our corporate social responsibility. We call it “environmental stewardship.” It’s the efficient and sustainable use of natural and economic resources incorporated into such practices as energy conservation and biodiversity preservation. Silver Star Brands has invested $150,000 in lighting upgrades at its distribution center, resulting in annual electricity savings of 1,100,000 kilowatt hours. This is the equivalent of providing electricity to 100 homes or the energy of 1,990 barrels of oil. This project reduces our carbon footprint by 2,522,920 pounds of CO2 annually. Read more about this successful project. Silver Star Brands uses corrugated shipping containers made from more than 60 percent post-consumer content. 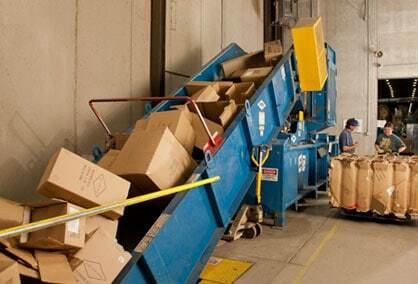 Silver Star Brands’ distribution center recycles 600 tons of cardboard and 60 tons of office paper. From 2005 to 2007, our use of lighter-weight paper has reduced our total wood use by 1,472 tons, or 10,191 trees. The energy saved was 21,806 million BTU’s, enough to power 240 homes each year. Greenhouse gases were reduced by the equivalent of 4,364,582 pounds of CO2, or the emissions from 396 cars per year. Wastewater was reduced by 10,219,474 gallons. The numbers speak for themselves. The Silver Star Brands Foundation donates more than $100,000 each year to support charitable, scientific, literary and educational institutions. The Wisconsin Sustainable Business Council recognized Silver Star Brands as a “Green Master” in both 2013 and 2014. The Green Masters Program recognizes Wisconsin organizations that have integrated sustainability into their business. Through the program, points are awarded for sustainable actions in nine key areas. Green Masters companies are those that score in the top 20 percent of businesses in a given year.